This week on The Scare-ening, Heidi and I will be welcoming actress/writer Brea Grant. 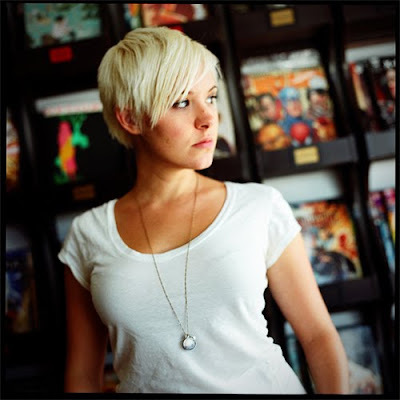 She was on Heroes, she was in Rob Zombie's Halloween II, and with her brother Zane she's the co-author of We Will Bury You, a new comic mini-series from IDW Publishing. Brea is so rad that she'll also be taking your questions- yes, even questions from YOU. Having her on the show means I need to watch Halloween II...so you'd all better listen, dammit. Don't let my suffering be in vain! Okay, that's not fair. Who knows, maybe I'll love H2! Weirder things have happened...like that time I went to eat some Cheez-Its and I found two of them fused together. Man, that was weird! She's pretty! I have a really good feeling about this week's Scare-ening you guys! Make sure you see the unrated, directors cut of Halloween II- it's WAY better than the version that was shown in theaters. Why is it that you are "on" a television show, whereas you are "in" a movie? I don't understand the relationship betwixt the spatial dimensionalities of disparate motion picture media. Even odder, perhaps, is that many filmmakers and actors refer to movies as "shows". As to "in" and "on", it may have to do with length- a movie is around 2 hours, whereas a TV show is an ongoing saga- actors appear in multiple episodes vs. a single film. Or maybe it stems from the fact that TV shows are "on" a TV. Linguistics are neat! Is she standing in front of comics for a Heroes promo shop? Or is she just one of those cool ladies who likes to have her picture taken in comic shops? I continue to drag myself through Heroes and I must say that it got far less interesting once they killed Brea's character off. They didn't give her a whole lot to do but she made the most of what she was given. Thom, I believe the photo is a promo for the comic she co-wrote. She is a big geek, however, and she does frequent comic shops. I did! I watched it last night. I'll have a review up tomorrow. After all the "Don't watch it!! "s I got on my Facebook page about it...well, I guess I thought it would have been worse. I made it through alive!